One of the best ways to get to know Stockholm is to visit its local parks, pubs, and restaurants. While areas like Gamla Stan and Djurgården give you a glimpse of the city’s history, places where most locals hang out let you feel the city’s pulse and thereby, immerse yourself in the local culture. Technically, Norrmalm and Vasastan belong to one area but Stockholmers regard them as different places. Both areas, however, are filled with interesting sights and spots that a day’s stroll or perhaps an evening walk around this side of the city allows you to experience Stockholm as a local. Norrmalm is a major commercial district where both local and international boutiques line the streets, much to the delight of avid shoppers or curious on-lookers. Norrmalm is actually the starting point getting anywhere in the city as most major streets lead up towards it. While mostly a residential area, Vasastan is filled with quaint local bars and clubs. The best thing about this part of the city is that you don’t tourist prices for your meals or your drinks. In the day, a stroll around the neighbourhood is a good way to familiarise yourself with Swedish architecture. Norrmalm is essentially the center of city as it is near the Central Station. All you have to do is take the exit going to Sergels Torg if you’re coming from T-Centralen. Kulturhuset is right by the exit and from there, you could make your way down Norrmalmstorg or Drottninggatan (the side that leads you away from Gamla Stan). Getting around Norrmalm and Vasastan is quite easy as there are a number of train stations that dot the area. All you have to do is get either a regular ticket called a remsa which is good for about 10 stations. Each remsa costs about 200 kronor. Youcould also purchase a Stockholm Card which works as a commuter card and a museum pass. If you’re walking around this side of town during the day, it’s best to have good shoes on as most spots are a couple of meters away from each other. In the corner of Norrmalm which is between Gamla Stan (Old Town) and Östermalm, you’ll find Kungsträdgården (The Royal Garden). In the 1980’s this combined square and small park was renowned for gang fights. This is all gone now. Kungsträdgården is a really nice spot for an ice cream or a coffee, overlooking the Royal Castle or just sitting on a bench and enjoying the sun. 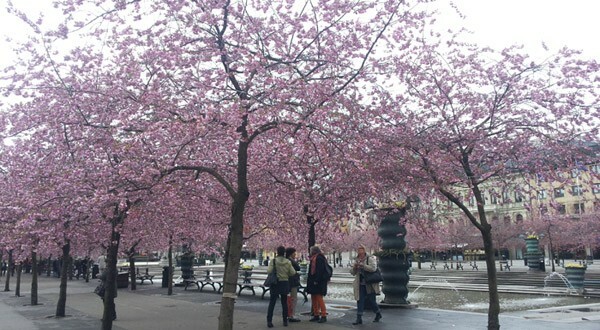 If you visit Stockholm in May, you may be lucky enough to be in Stockholm when the many Japanese cherry trees in Kungsträdgården are in full bloom. During these few days, people tend to just walk or simply stand under the pink trees, take photos and just smile. Kungsträdgården is often full activities, from ice skating and Christmas markets during winter to all sorts of musical and other festivals during summer. Definitely worth a visit if you want to do what many locals (and tourists) do. One of the most popular tourist attractions, the Ice Bar features a club almost made entirely of ice. It’s a fun place to visit and don’t worry, the entrance fee includes a really warm coat. The entrance fee might be a bit expensive for those on a tight budget, though. It costs SEK 180 and then you are allowed to stay for 40 minutes. Since September 2012, you can also book a breakfast in the IceBar – it’s called an “Icebar Breakfast – Cool Awakening” and you book it by phone: +46 (0)8-50 56 35 08. They also have events for kids, called Ice Kids. As Stockholm’s centre of culture, this building has almost anything you could imagine. It has a bar, a theatre, a library, an area where you could play chess, and even a miniature scale of the city itself. Located on Drottninggatan, this gorgeous art nouveau structure opens to an amazing courtyard built in the early 1900s. The bath house features a spa, a swimming pool, a bar, and a restaurant. If you’re looking for a place to relax, this might be worth the visit. They also server really nice breakfast buffets from time to time, so stop by the bath and check it out if you’re close to it. This beautiful building is quite hard to miss if you’re walking along Humlegården, one of the area¨’s many parks. The National Library houses printed material from the 1600s. The best things in life are free and nothing is truer this part of town. Vasastan has a number of parks where you could sit back and take it easy. Vasaparken is located between Sankt Eriksgatan and Odenplan. The area was used as a potato farm during World War I. Vasaparken has the city’s best playground, so head over if you visit with kids. On the other hand, if you’re after a view of the city, Observatorielunden is the place to visit. Unfortunately, this park can sometimes be dominated by drug addicts, so visit in the middle of the day, not in the evening.